Just in–a new automatic knife named the Atomic. This auto knife has everything we look for in a value automatic knife. 1st–the price is right. At just $19.25 it isn’t going to put a major dent in your wallet. 2nd–the action is fast and the lock up is tight. This is critical. Why have an auto knife if it doesn’t work good? 3rd–the quality of construction is good. The workmanship and materials are solid. 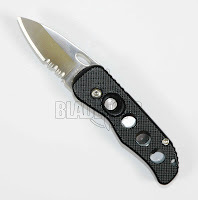 This auto knife should function great as an every day carry for most people. If you have been looking for a solid auto knife that works when you need it to–check out the Atomic automatic knife. Plus, since the blade is under 2″, it is cali-legal. Get yours while they are hot.